This morning, still busy inspiring educators, the Office of EdTech sent out a tweet about today’s summit. As the Obama administration begins to wind down, the Department of Education’s Office of Ed Tech is still working–hosting a Teacher Preparation Summit today with participants who are grass-roots innovators in teacher education. It reminds me of the true legacy of the Office of Ed Tech during President Obama’s administration. Through their willingness to throw open the doors of the Department and even the White House to teachers, technology educators, librarians, professors, superintendents, and more, they have modeled a willingness to trust and respect informal grass-roots leaders within the education community itself. In fact, they have very effectively reached out to these practitioners via social media and in person to ask their expertise, highlight their stories, and invite them to be models for others. It’s evident that the Department’s interest in listening to these voices has only grown stronger throughout the administration’s tenure. And the Office of Ed Tech (perhaps propelled by the democratization that Twitter allows everyday educators) has done a remarkable job of reaching out and identifying the “on the ground” leaders in education. The National Ed Tech Plan and the Future Ready initiative(which expanded to include Future Ready librarians) are hallmarks of the work done at the Office of Ed Tech to move districts forward, and the planning for both of these included grass roots experts across the country. Initiatives like #GoOpen spurring on the use of OER is led by a former K12 educator. The Department of Education also threw open its doors to host several EdCamps, hosting practicing teachers, principals and librarians from around the country. The National EdTech plan itself was crafted by practicing educators. And President Obama has even hosted STEM educators at the White House and honored a variety of Champions of Change for Connected Learning throughout his term (I was so honored to have been named one). This impetus to flatten the lines that divide policy from practice and to engage with real “on the ground” educators has been a tremendous opportunity. And the Department’s encouragement to those grass leaders to continue their work will continue to have a powerful ripple effect. By understanding that the people who practice the daily work have value, have ideas, have leadership capabilities and are passionate, the DOE has drawn on the best of us. It is likely that the Department will return to business as usual after this administration ends and that’s a painful reality for many who can feel the vibrant enthusiasm that this Office of Ed Tech has had for educators. So I, for one, want to say thank you. Because whether grass roots voices of education leaders will continue to be listened to at the national level, the President and the Office of Ed Tech have seeded a generation of informal leaders, spurred them to do more, embraced and highlighted their work, and energized planning for the future of what schools can be. For that, they deserve a huge thank you–because our students will see the benefits of that work for years to come. 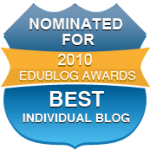 If you appreciate the Office of EdTech’s work, add a comment or thank you here or on your own blog. Let them know their work has been appreciated and will continue to make a difference. I also want to send a special thank you to Richard Culatta, Katrina Stevens, and Sara Trettin for reaching out, and lastly, I want to thank President Obama, for asking educators to look forward, to realize that connectivity is the equalizer, and to keep us looking ahead. Thank you.